This interim upgrade GMOS-N detector array consists of three 2048x4608 chips arranged in a row. These e2v deep depletion (DD) detectors (device designation: 42-90 with multi-layer 3 coating) have enhanced blue and red response compared to the original EEV detectors, though these devices are not as sensitive in the red as the Hamamatsu detectors that will be installed in the near future. The fringing characteristics of the e2v DD devices is also much improved (<1% peak-to-peak expected) compared to the original EEV CCDs. Everything else (pixel scale, readout speed, image orientation, read noise, gain, full well) about these detectors is very similar to that of the original EEV devices. These devices were installed in mid-October 2011, and the first science data was collected with the new detectors November 22. See the Status and Availability webpage for more details. The plot below gives the anticipated QE comparison to the current EEV CCDs in both GMOS-N and GMOS-S as well as to the eventual Hamamatsu SC and HSC devices. These QE plots are taken from general e2v information and will be updated with the QE curves supplied by the manufacturer when the CCDs are delivered. 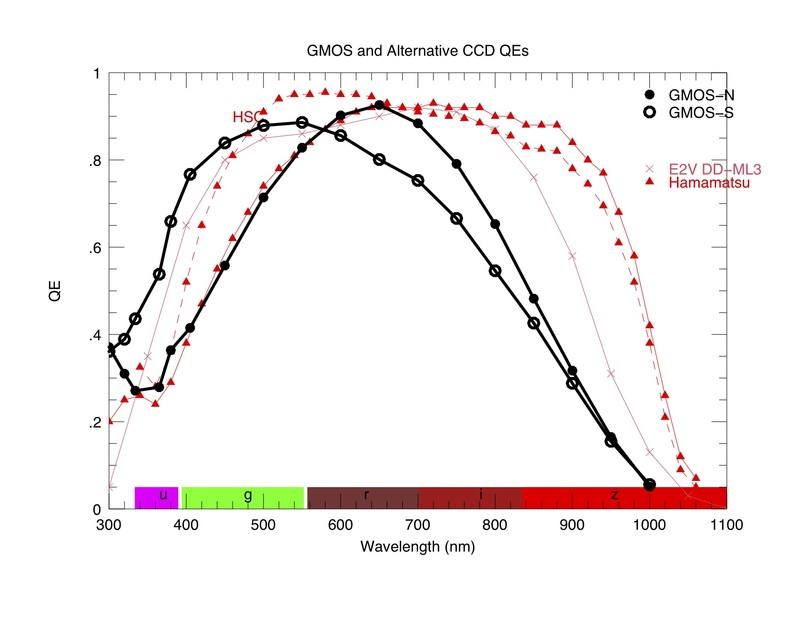 QE Comparison for the current and future GMOS CCDs. Click to view full image. Commissioning results for the e2v Deep Depletion CCDs were presented at the 2012 Winter AAS meeting in Austin, TX. Three poster presentations provided an overview and status report on both the e2v DD and Hamamatsu upgrade projects, results from on-sky commissioning and science data for the e2v DD CCDs, and results from daytime characterization data. These poster presentations are available for download as .pdf files below. GMOS CCD upgrade project status (poster 1). Click to view full image. GMOS-N e2v DD on-sky commissioning results (poster 2). Click to view full image. GMOS-N e2v DD daytime characterization results (poster 3). Click to view full image. The table below summarizes some of the e2v DD detector/controller characteristics. n/a values to be updated as detectors are characterized. The table below gives average gain/read-noise values for the new GMOS e2v DD devices operating with the SDSU controller. The values are averaged over all 6 amps. The full table of read-noise and gain values at all settings and for all amps is available here. The Slow Read / High Gain mode is not offered as it has been deemed to be of little scientific use. Slow Read / Low Gain is the primary mode for science use. Fast Read / Low Gain may be of use, for example, with acquisition observations or for time resolved observations. Fast Read / High Gain is expected to be used primarily for very bright targets.